This review is so overdue that it’s a little embarrassing! 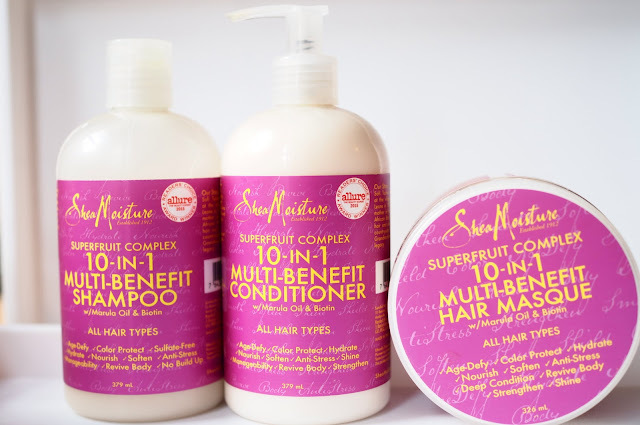 However, since the Shea Moisture Superfruit Complex 10-in-1 Multi-Benefit range arrived, it’s definitely become a staple, and I’ve got through backups of everything pictured here. It’s a great range. Long cult products in the US, I think there were lots of us UK beauty bloggers who were super-excited to see Shea Moisture finally make it over here, I know I certainly was! Now, around a year since they appeared in Boots stores, they’ve become a staple on many bathroom shelves – they were the first thing I unpacked when I moved house recently, that I do know. Paraben-, mineral oil-, sulfate- and silicone-free, the Superfruit Complex range is perfect for needy hair that gets a bit lank when too-rich products are used. I have wavy, coloured and porous hair. Initially, I thought the Superfruit Complex products were going to be too light to have much of an effect on my hard to manage hair, but I was wrong. Whilst the products are light in texture, they really do pack a conditioning punch, and my hair loves this stuff. I alternate between using the conditioner and the masque usually (bear in mind I only wash my hair 1-2 a week usually, so it’s a weekly masque treatment), but my hair is left soft and smooth and easy to style no matter what I’ve done to it in the days preceding, or what styling I subject it to afterwards, either, it makes my barnet lovely and shiny. Not overly-fragranced, there’s just a gentle sweet smell that fades quickly, so it won’t clash with any other fragranced products you’ll use afterwards. Once I run out of the latest batch, I think I’m going to try the Raw Shea and Cupuacu Frizz Defense range, as the combination of this and my Silke London hair wrap means my hair requirements are changing.